Happy Kitchen Sink Stamps Monday! Isn't this Multi Step Invisible Snowman just the cutest with his button eyes! Today I've created two cards using this new release to share with you. 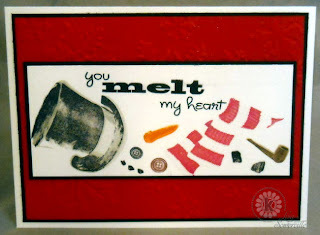 I couldn't resist making a melted snowman to go with the "You melt my heart" sentiment. Here's another fun card using this same set. I used the same color recipe for both cards, see below. Note to self....remember to spritz to let the air bubbles out of the Pearl Mist before spraying your project. It just so happened a splotch of glitter ended up on the Red button eye - what are the odds of that happening! Here's some more exciting news from the Kitchen....KSS is going to have their own Forum and public gallery! You'll be able to ask questions, find information (color recipes and more), share your own KSS creations and chit chat with the Crew! When you ask? Mark your calendar and plan to join myself and other members of the KSS Crew as we welcome you to the Grand Opening of the KSS Forum/Gallery this New Year’s Eve, the KSS Crew will be in the forums from Noon to Midnight EST. There will be plenty of fun Challenges, Games, Prizes, and Giveaways…. oh, and a new stamp release …. available first only to those in attendance in our forum at the stroke of Midnight (EST)! Love this! Tooo cute! The colors are adorable! ho ho ho....are these not the cutest cards, luv them! The perfect touch of whimsy with these fun images, Lisa! What a fabulous design!! the invisible snowman is indeed cute! Great cards, love the melt your heart one! Lisa, these are both sooo wonderful! 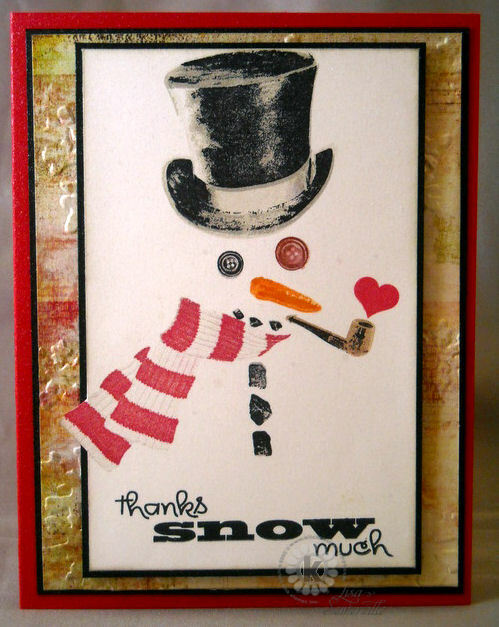 Love your melted snowman, and how you have the scarf coming off the main panel on the second card! Too fun! LOL! What a fun snowman card Lisa!! I have to try the melting snowman next time. Fab cards and sneak peek! Both are adorable! I do love the melted parts!!! These cards are adorable,Lisa! I really love the special little glimmer in his eye! Lisa ~ These are just adorable...what great "fun" images to use for Christmas and you knew just how to make that snowman melt...Too stinking cute!! 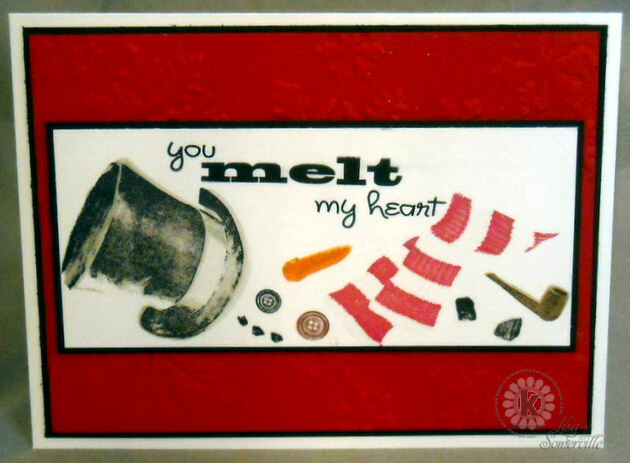 I think I'm in love with your melted snowman. I absolutely LOVE IT! The cards are adorable, the snowman is so cute! Thanks for joining the frosty fun over at Gingersnap Creations. The melting card is just too fun ... so glad you're joining us as a Muse in January ... thanks for joining our wintry wonderland at Gingersnap Creations.